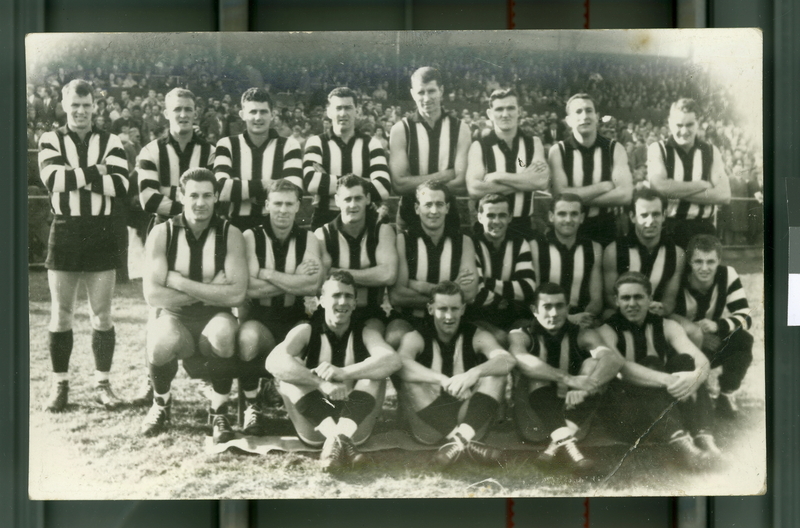 This is a Collingwood (VFL) Senior Team, most probably from 1960. Weideman, who is at the centre and presumably captain of this side, first skippered the Magpies in 1960. Merrett finished his career in 1960. Rosenbrock played his first senior game in 1960. Photographic print. Taken at Collingwood. Black shorts. Photo in NSM Collection with all players named filled a number of players names. The identified players include Kevin Pay who only played one match in 1960, a review of the other players in the match confirms that this photo was taken at that match.